One of the most fundamental issues of our age is how we come to know about the world – how do we as an increasingly interconnected and globalised planet form opinions and make decisions about important issues, and how can we come together to shape our common future? Environmental issues are obviously a massive part of this. The way each of us lives our life in relation to the environment stems from the ideas we hold about the place of the environment within our societies. What we know about environmental problems comes from interactions in our personal networks, from the corporate mass media, and from participation in global communities of people who share similar interests. Ultimately our environmental future comes down to a question of values, of deciding individually and collectively how we wish to live in the world. The values which circulate through the world’s networks of media and communication play a big role in shaping these decisions. 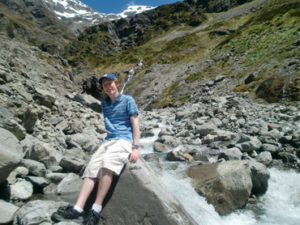 My research looks at how emerging forms of global media can be used to circulate environmental discourses, particularly with regards to issues such as climate change, and the extent to which these might inspire alternative ways of thinking and acting on humanity’s relationship to the environment. This includes how NGOs and activist groups operate within and across different cultural contexts, and the ways in which traditionally marginalised perspectives such as those of indigenous groups (for instance the Maori people of New Zealand) can contribute to broader environmental debates. Through my career to date I have seen my academic work as intertwined with my activism and desire for social change. I strongly believe that the humanities and social sciences have an important role in such debates. While the natural sciences provide an indispensable knowledge base, they cannot by themselves tell us what action to take next. It is for social researchers to offer visions of alternative futures and different ways of conceiving of the relationship between nature and society. This requires the inclusion of perspectives from across disciplines and across cultures. This is something I intend to pursue throughout my future career, most likely focused on academia but with strong links to civil society, bringing together diverse viewpoints and working to ensure they have a voice in deciding our global future. 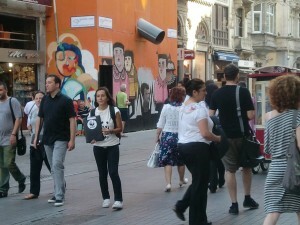 A WWF volunteer on Istiklal St in Istanbul, Turkey. Taken in 2011 when I was doing research on environmental campaigning in Turkey, particularly in relation to how transnational campaign organisations approach their work in the face of differing ideas about modernity, development and environmental protection. 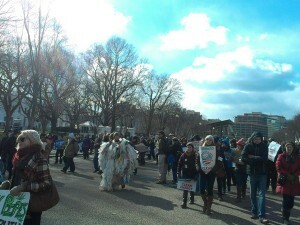 Protesters at a rally against the KeystoneXL oil pipeline in Washington DC on February 17, 2013. The anti-Keystone movement has become one of the most successful environmental campaigns in the US in recent years. 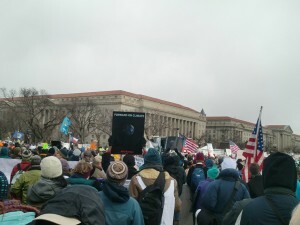 This rally attracted over 40,000 people. Keystone protesters outside the White House. Led by 350.org, the campaign uses mobilisation through social media combined with embodies displays of action.